Nutrition, Biochemistry and Toxicology Division, Defence Food Research Laboratory, Siddarthanagar, Mysore - 570011, Karnataka, India. ABSTRACT: Motion sickness (MS) is a conflict between visual and vestibular system leading to nausea and vomiting. The present study aimed to standardize a method to induce MS in Balb/c mice model. Conditioned taste aversion (CTA) utilizing saccharin solution (SS) was used as MS index. Mice were divided into three groups (n=6); group 1 (G1), group 2 (G2) and group 3 (G3). Two bottle test [TBT, both bottles consists of either drinking water (DW) or SS] and two bottle choice test (TBCT, one bottle comprises of DW and other SS) were performed. G2 and G3 experienced rotation for 15, 30 and 45 min using a dancing shaker whereas G1 received no rotation. The consumption of SS before and after MS induction was recorded. Acetylcholine esterase and cortisol levels were detected in mice brain, and HPLC-ECD detected plasma samples and neurotransmitters. It was found that the rotation of 30 min resulted in a significant reduction in the SS consumption in the G3 group when compared to G1, thus indicating that the sickness is induced. Acetylcholine esterase (0.033 µmol/min/mg), histamine, calcitonin gene-related peptide (CGRP, 3089.38 ng/g tissue) and cortisol (62.81 pg/ml) levels were increased in G2 and G3 groups when compared to G1. HPLC results show that levels of epinephrine, norepinephrine, and dopamine increase, whereas serotonin decreases in the G2, G3. Hence, this study validates the use of this MS model for further mechanistic studies related to motion sickness to develop anti-motion sickness food supplements. INTRODUCTION: Motion sickness (MS) is specifically known as kinetosis and is a collective term indicating the uncompromising condition faced by 50% of travelers traveling by sea, road or air. MS is the visceral discomfort induced by apparent or real motion stimulation 1. It is caused basically due to a mismatch between sensory movement in the middle ear and the visually felt movement 2. Experiencing restlessness, cold sweat and pallor are the few early indications of MS which is eventually followed by severe symptoms such as nausea and vomiting 3. There have been different theories postulated to explain the mechanism of MS such as sensory conflict theory, postural instability theory, nystagmus hypothesis and poison theory 4. Mechanism of neural processes and the neuro-psychological basis of kinetosis is still not known. Some of the neurotransmitters such as acetylcholine, histamine, dopamine, serotonin, epinephrine, and norepinephrine play a major role during MS. It has been suggested that low levels of serotonin may increase the symptoms of MS, thus making people more susceptible to MS 5. Neural signal mismatch leads to the increased release of histamine and acetylcholine which triggers the emetic centers and eventually play a role in habituation respectively. Increased levels of dopamine, epinephrine and norepinephrine are produced during MS, but the underlying mechanisms are not known 6, 7. In the recent scenario, attention has been directed towards the use of rodent models as the experimental model for motion sickness. Rodents are not capable of vomiting; hence parameters such as conditioned taste aversion (CTA) or behavior for kaolin consumption has been used as motion sickness index 8. The present study was aimed to standardize a rodent model for induction of motion sickness and as well analyzing the changes in the various behavioral aspects and biomarkers involved during the motion sickness. The purpose of the present study was to develop an easy method to handle, quickly quantifiable model which could help in developing herbal antidotes or food supplements against motion sickness and also to study the mechanism of action of the developed antidotes by exploring the pathways it has affected. This model would be a potential source in understanding the neurophysiology of motion sickness by understanding the neural pathways involved during the sickness. Chemicals: Saccharin, acetylthiocholine iodide, 5, 5’-dithiobis (2-nitrobenzoic acid), citric acid, triethylamine, EDTA, DL-10-camphor sulfonic acid were procured from Sigma Aldrich, St. Louis USA. Methanol and disodium hydrogen orthophosphate were purchased from SRL Mumbai, India. Animals: Animal studies were performed according to the Institute Animal Ethical Committee regulations which are approved by the Committee for the Control and Supervision of Experiments on Animals (CPCSEA; IAEC-2016/BN/1). Female Balb/c mice weighing in the range of 20-25 g were selected from stock bred in central animal house facility, DFRL, Mysore and housed in a cage (acryl fiber) in a temperature controlled manner (25 ± 2 ºC) and were maintained in a 12 h light/dark cycle. The mice were fed with pellets and water ad libitum. Standardization of Animal Model for Induction of Motion Sickness: Eighteen white, female Balb/c mice were divided into 3 groups (n=6) namely group 1 [G1, No rotation, access to drinking water (DW) / saccharin solution (SS)], group 2 (G2, receives rotation and access to only DW) and group 3 (G3, receives rotation, access to DW / SS). Dancing shaker (Model no. 3040, S. no. 1861619, Tarsons Pvt. Ltd., India) which rotates in an angular motion was used for rotating the animals. Animals were rotated at a speed of 80 rpm in an angular clockwise direction in transparent cages attached to the shaker and were free to move around in the cages. Conditioned taste aversion (CTA) utilizing 0.15% saccharin solution (SS) was used as MS index. 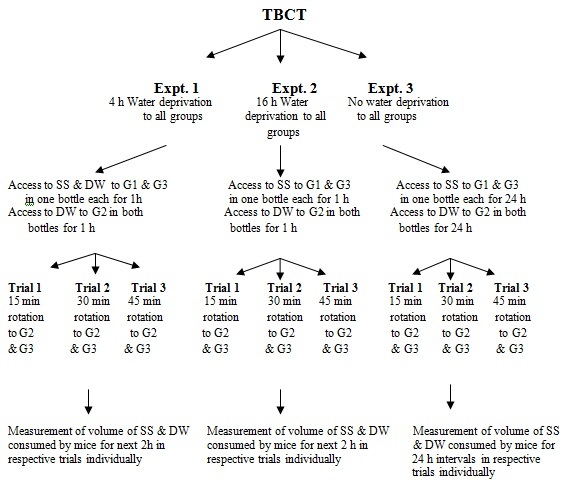 Two different experimental regimes namely, two bottle test, TBT (Both the bottles consists of either DW /SS) and two bottle choice test, TBCT (One bottle comprises of DW and other SS) were performed 9. Acclimatization Phase: During this phase (day 1 to 7) animals were caged individually in separate cages and acclimatized to water deprivation schedule of 4 h, 16 h and 24 h in separate individual trials. 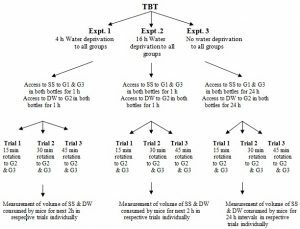 In all the trials the water deprivation schedule animals were given access to DW/SS for a period of 1 h, and the intake volume measured. Test Phase: During the second week (day 8 to 14) animals were provided with the schedule as acclimatized earlier which is water deprivation followed by access to DW/SS for 1 h and intake volume measured. Immediately after 1 h access animals belonging to groups G2 and G3 were rotated for different periods (15, 30, 45 min) in separate individual trials. Immediately after rotation animals were returned to their cages and given access DW/SS and intake volume measured respectively. The trial was repeated thrice during the second week on alternate days. In all the trials carried out animals of G1 group were deprived of rotation. During all the trials the volume of DW and SS consumed by mice before and after induction of MS was measured. SS and DW preference ratio was calculated for all the groups of mice. The animals were sacrificed immediately after induction and the brain and blood samples collected for further analysis. The hypothalamic region from the intact brain was dissected under the supervision of a veterinary expert associated with our institute. Acetylcholine Esterase (AChE) Assay: AChE activity in the brain samples were analyzed by the spectrophotometric method. The principle is based on the formation of thiocholine by the action of AChE which further forms a yellow color on reaction with 5,5’-dithiobis(2-nitrobenzoic acid). The intensity of yellow color was quantified at 412 nm and the enzyme activity of the sample was expressed as μmol/min/mg 10. Determination of the Neurotransmitter Levels in Brain Samples: The brain samples were homogenized with 0.9% perchloric acid, centrifuged at 10,000 rpm for 15 min. The supernatant was collected and filtered through a 0.22 μm filter and used for HPLC analysis 11. HPLC system with an electrochemical detector (Model 1645, Waters, USA) and C-18 columns (Sphericob, RP C18, 5µm particle size, 4.6 mm × 250 mm at 30 ºC) was used for the analysis. Mobile phase comprising of 82.4% of water, 17.6% of methanol, 20 mM of disodium hydrogen orthophosphate, 15 mM of citric acid, 9 mM DL-10-camphor sulfonic acid, 1.512 Mm of triethylamine and 0.0876 mM of EDTA was used with 0.7 ml/min as the flow rate. The concentration of neurotransmitters in samples were calculated by comparing with the peak area of standards and expressed as μg/g tissue. Estimation of Histamine Levels: Histamine levels in the brain hypothalamic samples were detected using 96 well ELISA kit (Cloud-Clone Corp, Texas, USA). Brain samples were homogenized in 0.1 M perchloric acid followed by centrifugation at 10,000 rpm for 15 min. Supernatant was collected and histamine levels detected as per the instructions of the kit. Detection of Cortisol and Calcitonin Gene Related Peptide (CGRP): Cortisol levels in plasma samples were quantified using 96 well ELISA kit (Cayman EIA kit, Cayman chemical company, MI, USA). Plasma samples were analyzed for the variations in the CGRP levels as per the manufacturer’s instructions (Cloud-Clone Corp, Texas, USA). Statistical Analysis: Statistical analysis was done using GraphPad Prism 6 software. Comparisons among different groups were done using Tukey’s multiple comparisons test with P < 0.05 considered as significant. Validation of MS Model: The Motion sickness index (MSI) showed that in all the trials conducted animals preferred saccharin consumption before rotation and avoided saccharin consumption after rotation, thus showing CTA towards SS. FIG. 2: EXPT 1A: TBT (4h WATER DEPRIVATION SCHEDULE), VOLUME (%) OF SACCHARIN SOLUTION (SS) AND DRINKING WATER (DW) CONSUMED PER MICE AFTER ROTATION OF A) 15 MIN; B) 30 MIN; C) 45 MIN RESPECTIVELY. Percentage of consumption was calculated as mean ± SD (n=6) at P<0.05. FIG. 3: EXPT 1B: TBCT (4h WATER DEPRIVATION SCHEDULE), VOLUME (%) OF SACCHARIN SOLUTION (SS) AND DRINKING WATER (DW) CONSUMED PER MICE AFTER ROTATION OF A) 15 MIN; B) 30 MIN; C) 45 MIN RESPECTIVELY. Percentage of consumption was calculated as mean ± SD (n=6) at P<0.05. As depicted in the results when compared to TBT Fig. 2 TBCT Fig. 3 was a better regime, as the animals in the G3 preferred SS than DW before rotation and vice-versa after rotation. Hence, indicating that the MS is induced. From all the experimental setups followed experiment 1 (4 h water deprivation and 30 min rotation), SS preference ratio of G3 after rotation was 3 fold lesser (1.85 %) than G1 (no rotation, 8.33 %) whereas the DW preference ratio of G3 after rotation is 10 % Fig. 3B which is comparable to the DW consumption % of G1 group (12.33 %), thus further validating the usage of SS with TBCT regime as motion sickness index (MSI) and this model proves to be the best for induction of MS.
Acetylcholine Esterase (AChE) Activity: AChE levels in the brain samples of mice from groups G2 and G3 which experienced rotation increased when compared to the NC group (No rotation). This, in turn, indicates that the levels of acetylcholine in the brain increase in the groups with rotation (G2 and G3) when compared to G1 group Fig. 8. Variations in Neurotransmitter Levels: Neurotransmitters detected by HPLC, the levels of dopamine, epinephrine and nor-epinephrine increased considerably in the whole brain samples of G2 and G3 when compared to the G1. Serotonin levels were decreased in G2 and G3 groups respectively Table 1. Values are expressed as mean ± SD for six mice per group. *Significantly different when compared to that of normal control group (P < 0.05). Histamine levels in the hypothalamic region of brain samples of G2 and G3 groups were higher when compared to the NC group Table 2, thus indicating the increased release of histamine in the hypothalamic region of the brain during MS.
Cortisol and CGRP Levels: Cortisol levels in the plasma samples of groups G2 and G3 showed 2 to 4 fold increase respectively when compared to NC group Fig. 9A. The level of CGRP was found to be increased in brain samples belonging to the G2 (2734.10 ng/g tissue) and G3 (3089.38 ng/g tissue) group when compared to G1 group (2142.42 ng/g tissue). In the present study Balb/c mice, dancing shaker and CTA towards saccharin solution was used to standardize the procedure for induction of motion sickness. The animals from groups G1 and G3 gained access to SS in TBT, whereas G2 (positive control) received DW. In contrast during TBCT, a choice was provided between SS and DW to animals from G1 & G3, but G2 received only DW (positive control). Animals from groups G2 and G3 received rotation, but animals of G1 were devoid of the same. It was observed that the mice from both G3 and G1 preferred SS over DW before rotation, whereas after rotation the consumption of SS by mice belonging to G3 showed a steep decline when compared to G1. The volumes of DW consumed by mice from G2 group before and after rotation were comparable. It was found that during both the protocols named TBT and TBCT, the consumption of SS was reduced in the G3 group (rotation provided) when compared to the G1. In TBCT (animals provided with a choice between SS and DW) mice from G3 group preferred SS when compared to DW before the rotation whereas the consumption of SS was reduced considerably after rotation. This indicates the sickness was induced as the animals displayed CTA towards SS since they avoided SS after rotation. TBCT method was found to be better than TBT as MS index. 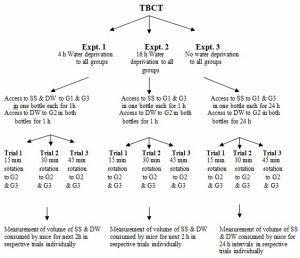 Among the three experimental setups followed, it was observed that the TBCT protocol involving 4h water deprivation (Experiment 1) followed by rotation of 15 and 30 min in different trials showed appreciable results Fig 3A and 3B. It was also found that animals get accustomed to the rotation when rotated more than 30 min Fig 2C, 3C, 4C, 5C, 6C, and 7C. Hence, sickness was induced too a much lesser extent. As depicted in Fig. 2, it is evident that animals from the G3 group were induced with sickness to a greater extent when rotated for 15 and 30 min when compared to 45 min. The SS consumed by mice from G3 group is much lesser compared to the G1 group when rotated for 15 and 30 min respectively. But the difference in consumption when rotated for 45 min was not much. This may be the reason that animals are acclimatized for MS. FIG. 4: EXPT 2A: TBT (16h WATER DEPRIVATION SCHEDULE), VOLUME (%) OF SACCHARIN SOLUTION (SS) AND DRINKING WATER (DW) CONSUMED PER MICE AFTER ROTATION OF A) 15 MIN; B) 30 MIN; C) 45 MIN RESPECTIVELY. Percentage of consumption was calculated as mean ± SD (n=6) at P<0.05. FIG. 5: EXPT 2B: TBCT (16h WATER DEPRIVATION SCHEDULE), VOLUME (%) OF SACCHARIN SOLUTION (SS) AND DRINKING WATER (DW) CONSUMED PER MICE AFTER ROTATION OF A) 15 MIN; B) 30 MIN; C) 45 MIN RESPECTIVELY. Percentage of consumption was calculated as mean ± SD (n=6) at P<0.05. In experiment 2 where 16 h water deprivation schedule was followed along with TBT Fig 4A and 5A and TBCT Fig. 4B and 5B in separate trials, the sickness was induced in the animals but the MSI results obtained were not as good as the results obtained during 4h water deprivation schedule. 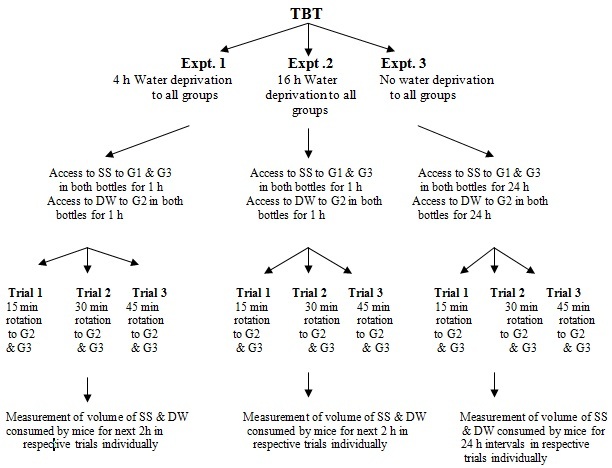 In experiment 3, access to SS and DW was provided for 24 h to G3 and G1 whereas DW to G2 and animals were subjected to the rotation for 15, 30 and 45 min in individual trials and the consumption of SS and DW monitored for every 24 h interval. It was found that TBCT Fig. 7 test provided better results than TBT Fig. 6. As evident from the values in Fig. 7, when rotated for 15 Fig. 7A min the sickness continued till 48 h as the SS consumed by mice from G3 group were lesser than the NC group. The sickness continued for 72 h when the animals were rotated for 30 min Fig. 7B, whereas 45 min Fig. 7C rotation didn’t show appreciable results. FIG. 6: EXPT 3A: TBT, VOLUME (%) OF SACCHARIN SOLUTION (SS) AND DRINKING WATER (DW) CONSUMED PER MICE AFTER ROTATION OF A) 15 MIN; B) 30 MIN; C) 45 MIN RESPECTIVELY. Percentage of consumption was calculated as mean ± SD (n=6) at P<0.05. FIG. 7: EXPT 3B: TBCT, VOLUME (%) OF SACCHARIN SOLUTION (SS) AND DRINKING WATER (DW) CONSUMED PER MICE AFTER ROTATION OF A) 15 MIN; B) 30 MIN; C) 45 MIN RESPECTIVELY. Percentage of consumption was calculated as mean ± SD (n=6) at P<0.05. Among all the protocols followed TBCT, 4h water deprivation schedule with 30 min rotation Fig. 3B used was the best experiment to study MS. CTA is a widely used, simple, sensitive, easy and stable index for quantifying motion sickness in a variety of species 12. Present results show that the consumption of SS reduced considerably in the group G3 after rotation when compared to the control group (G1, no rotation), thus validating our protocol for induction of sickness. Our results are comparable to previous studies where Wistar rats and CTA were used for the MS studies and showed decreased SS consumption after rotation when compared to before rotation 13 whereas this is the first study for standardizing a model for MS using Balb/c mice and dancing shaker with angular motion, which is easy to handle and readily quantifiable with the CTA as evident from the results. This method can be used as a standard model for induction of MS and the development of MS drugs. Acetylcholine is considered to be one of the major neurotransmitter playing a role during motion sickness as it is believed to be released from the hippocampus upon vestibular stimulation and eventually helps in the habituation process of motion sickness 14. Acetylcholine is also believed to be a neurohumoral agent that causes the symptoms of motion sickness 15. Hence, in the present study the brain samples obtained after sacrificing the animals were analyzed for AChE activity by the method described by Elman et al., (1961). It was found that the AChE activity in the brain samples of animals of G2 and G3 groups increased considerably when compared to G1 group Fig. 8, thus indirectly indicating that acetylcholine levels may have increased during motion sickness. Hence, AChE assay was a preliminary assay performed to check whether there were any differences in their levels in test groups when compared to control so that we may indirectly predict the levels of acetylcholine which is the precursor for AChE enzyme and can be considered as one of the biomarkers to study the motion sickness. Neurotransmitters such as dopamine, serotonin, epinephrine, norepinephrine, and histamine are believed to play major role in MS, although the neuropsychological basis of MS is still considered unclear. In the present study, we assayed the variations in the levels of neurotransmitters in brain samples of the animals belonging to all three groups by HPLC-ECD method. It was observed that dopamine, epinephrine, and norepinephrine levels increased appreciably in the brain samples of G2 and G3 groups whereas serotonin levels decreased in the G2 and G3 groups when compared to G1 brain samples Table 1. Our results are comparable to the available literature which claims that during motion sickness the levels of dopamine, epinephrine and norepinephrine are increased, but the underlying mechanism are still not clear 6, 7. It has been previously suggested that low levels of serotonin may aggravate the symptoms of MS, thus making individuals more prone to MS 5. It is also believed that neural signal mismatch causes the increased release of histamine and acetylcholine which triggers the emetic centers and activates the dopamine receptors leading to increased dopamine levels and eventually causing nausea. Histaminergic neurons are present in the tuberomammillary nucleus in the hypothalamus and pons-medulla oblongata which are one of the most critical regions in the brain containing histaminergic fibers 16, 17. The sensory conflict caused due to the various sensory signals activates the histaminergic neuron system followed by stimulation of the H1 receptor in the emetic center to produce the signs and symptoms of MS 18. Thus in the present study histamine levels were quantified in hypothalamic brain samples. As depicted in Table 2, the histamine levels in brain samples of G2 and G3 groups increased considerably when compared to the G1 samples. The results of the variations in neurotransmitters further validate the use of this MS model. Visual-vestibular conflict leads to a series of physiological and psychological reactions which eventually after a while causes activation of the hypothalamic-pituitary-adrenal axis resulting in the increased levels of cortisol 19. In the present study, we tested the variations in the plasma cortisol levels among the three groups of mice. It was observed that cortisol levels in the plasma samples belonging to G2 and G3 were increased drastically when compared to the G1 group plasma samples Fig. 9A. This indicates that the animals were stressed and experienced sickness due to the rotation and hence, the rapid increase of the plasma cortisol levels 20. Sensory conflict theory explains that the signal inputs from the visual system do not match with the inputs from the vestibular system and the lack of correlation leads to the sickness. It is a well-known fact that an active vestibular system is essential for the perception of motion sickness 21. Vestibular system innervations include both efferent vestibular neurons (EVN) and afferent vestibular neurons (AVN). EVN was previously considered to be cholinergic, but new evidence show the presence of both CGRP and choline acetyltransferase. CGRP is a protein present in the efferent vestibular system and the expression of CGRP in the vestibular nucleus increases during MS 13, thus suggesting that CGRP probably plays a role during MS which has to be further investigated. It is clear from the results depicted in Fig. 9B that the levels of CGRP in brain samples of G2 and G3 increased considerably when compared to that of G1 group samples by the previous literature. FIG. 9: A) CORTISOL LEVELS IN PLASMA SAMPLES (pg/ml); B) CGRP LEVELS IN THE BRAIN SAMPLES (ng/g TISSUE). Values are expressed as mean ± SD for six mice per group. *Significantly different when compared to that of Normal control group (P<0.05). When the animals were rotated in the transparent cages attached at the top of the dancing shaker, their body feels the movement and detected by their inner ear, but they do not see the motion visually inside the cage. Hence, these conflicting signals of vestibular and visual systems might be the reason for the CTA behavior eventually causing motion sickness. Along with the CTA results, studying the variations in the neurotransmitters, cortisol, CGRP during the sickness phase was very much necessary to validate the model of motion sickness and hence it was performed in brain and plasma samples. CONCLUSION: The purpose of the present study was to develop an easy to handle, readily quantifiable animal model for MS using Balb/c mice, CTA and dancing shaker. We obtained significant data as the animals displayed CTA towards SS after rotation. The variations in the biomarkers which are on par with the conventional theories according to the literature, our new MS model is a prominent model that could be used for the further mechanistic studies related to MS. ACKNOWLEDGEMENT: The authors are thankful to the Director, Defence Food Research Laboratory, for his constant support and encouragement during the period of the study. Zhang LL, Wang JQ, Qi RR, Pan LL, Li M and Cai YL: Motion sickness: current knowledge and recent advance. CNS Neuroscience & Therapeutics 2016; 22(1): 15-24. Golding JF and Gresty MA: Pathophysiology and treatment of motion sickness. Current Opinion in Neurology 2015; 28(1): 83-88. Lackner JR: Motion sickness: more than nausea and vomiting. Experimental Brain Research 2014; 232(8): 2493-2510. Koca CF and Bayinir T: Review of pathophysiology, epidemiology, diagnosis and treatment methods in motion sickness; a special issue. Journal of Turgut Ozal Medical Center 2017; 24(3): 365-70. Drummond PD: Effect of tryptophan depletion on symptoms of motion sickness in migraineurs. Neurology 2005; 65(4): 620-622. Kohl RL: Endocrine correlates of susceptibility to motion sickness. Aviation, Space, and Environmental Medicine 1985; 56(12): 1158-1165. Lucot JB: Catecholaminergic influences on motion sickness. Brain, Behavior and Evolution 1983; 23(1-2): 42-46. Yu XH, Cai GJ, Liu AJ, Chu ZX and Su DF: A novel animal model for motion sickness and its first application in rodents. Physiology & Behavior 2007; 92(4): 702-707. Ossenkopp KP and Frisken N L: Defecation as an index of motion sickness in the rat. Physiological Psychology 1982; 10(355): 36. Ellman GL, Courtney KD, Andres V and Featherstone RM: A new and rapid colorimetric determination of acetylcholinesterase activity. Biochemical Pharmacology 1961; 7(2): 88IN191-9095. Alburges ME, Narang N and Wamsley JK: A sensitive and rapid HPLC‐ECD method for the simultaneous analysis of norepinephrine, dopamine, serotonin and their primary metabolites in brain tissue. Biomedical Chromatography 1993; 7(6): 306-310. Ossenkopp KP and Ossenkopp MD: Motion sickness in guinea pigs (Cavia porcellus) indexed by body rotation-induced conditioned taste aversions. Physiology & Behavior 1990; 47(3): 467-470. Xiaocheng W, Zhaohui S, Junhui X, Lei Z, Lining F, and Zuoming Z: Expression of calcitonin gene-related peptide in the efferent vestibular system and vestibular nucleus in rats with motion sickness. 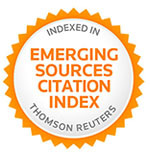 PloS One 2012; 7(10): e47308. Ericson H, Blomqvist A and Koohler C: Origin of neuronal inputs to the region of the tuberomammillary nucleus of the rat brain. Journal of Comparative Neurology 1991; 311(1): 45-64. Eisenman LM: Motion sickness may be caused by a neurohumoral action of acetylcholine. Medical Hypotheses 2009; 73(5): 790-793. Takeda N, Morita M, Kubo T, Yamatodani A, Watanabe T, Tohyama M and Matsunaga T: Histaminergic projection from the posterior hypothalamus to the medial vestibular nucleus of rats and its relation to motion sickness. The Vestibular System: Neurophysiologic and Clinical Research 1987; 601-617. Takeda N, Morita M, Horii A, Nishiike S, Kitahara T and Uno A: Neural mechanisms of motion sickness. Journal of Medical Investigation 2001; 48(1/2): 44-59. Eversmann T, Gottsmann M, Uhlich E, Ulbrecht G, Werder KV and Scriba PC: Increased secretion of growth hormone, prolactin, antidiuretic hormone, and cortisol induced by the stress of motion sickness. Aviation, Space & Environmental Medicine 1978; 1: 53-57. Xu LH, Koch KL, Summy-Long JOAN, Stern RM, Seaton JF, Harrison TS and Bingaman SANDRA: Hypothalamic and gastric myoelectrical responses during vection-induced nausea in healthy Chinese subjects. American Journal of Physiology-Endocrinology & Metabolism 1993; 265(4): E578-E584. Gong S, Miao Y L, Jiao GZ, Sun MJ, Li H, Lin J and Tan JH: Dynamics and correlation of serum cortisol and corticosterone under different physiological or stressful conditions in mice. PLoS One 2015; 10(2): e0117503. Golding JF: Motion sickness susceptibility. Autonomic Neuroscience 2006; 129: 67-76. Maheswari DU, Anand T, Manu TM, Khanum F and Sharma RK: Motion sickness induces physiological and neuronal alterations in mouse model. 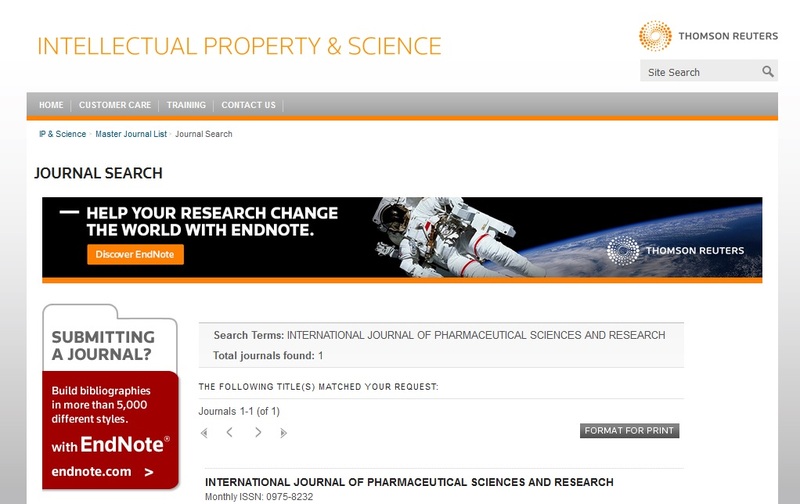 Int J Pharm Sci & Res 2019; 10(4): 1650-59. doi: 10.13040/IJPSR.0975-8232.10(4).1650-59.